Last week whale watching season started in Sydney, but you don’t need to be on boat to see whales while you are visiting Sydney. Sometimes you can just sit on the beach and watch whales. Bondi beach is one of most favorite beach in Sydney between tourist. It looks like not only humans like that beach but humpback whales like it too. Couple years ago while I was in Sydney I did have a pleasure to see whale at Bondi beach too. It was so close to the shore and it is probably beyond expression the feeling of surfers who were so close to that whale. Thought most of surfers were so busy with wave catching they even didn’t notice what is swimming behind them. 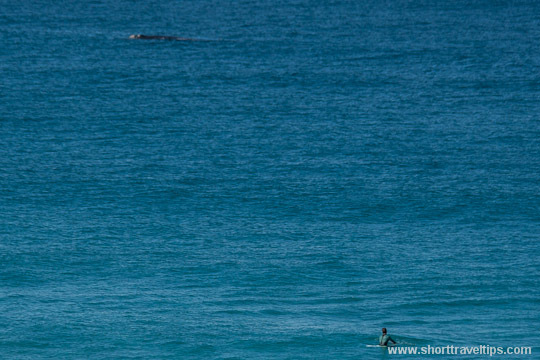 But this surfer in the picture did see it and may be was waiting that humpback whale to come even closer? That didn’t happen, but I was following that whale for an hour or more by walking on the shore till I reached South Head and whale was spotted by one of whale watching tour boat. You can see the picture here (the last one). I go to Bondi quite regularly and have often seen whales there. It is such a good site. I love being surprised by wild life in the ocean! Wow- looking at this photo I’m surprised by two things: 1. the whale, 2. how few people and surfers are in the water! When we were at Bondi there were soooo many people in the water!! I can’t imagine it this deserted. Jade, it is just how I did crop the picture. It was plenty of people there and that is why I didn’t like that beach. I’d probably jump out of the water if I saw a whale. Prefer to watch from shore. You can see whales from the beach? That’s so amazing! [email protected] We There Yet Mom? Wow! A whale that close to the beach! I have heard that Bondi beach was excellent, but I didn’t know that whales could be seen from there too! How cool. If you have the time, I’d love for you to link this post up with our Friday Daydreamin’ series too!